One more time you will have to help Detective Fields in his investigation. Read full description. Fully voiced mod. In this mod you will meet Detective Fields again ( the detective of my other mod "Hunting Down the Pint Sized Slasher" ). This time you will have to help Detective Fields to investigate the disappearance of a little girl. The office of Detective Fields is now located in the Canterbury Garage of Canterbury Commons. 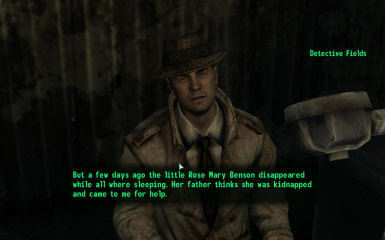 As in my other mod, quest markers wont lead you exactly to the clues or witness; once you reach a quest location you will have to explore, look for clues or people who give you hints about the location of the girl. the mod is fully voiced except for one character I couldnt voice. Male voices were all done by me and females voices were done by ChromicLights. This mod is longer than my other two mods .I didnt upload more images because I didnt want to upload spoilers about quest locations. Detective Fields will be essential during all the quest. Once you finished the quest you can hire him as follower, but he will be set to non essential. Taking items from any house in Minefield will be considered stealing to Minefield's inhabitants. Arkansas wont be hostile in this mod, but he will still be enslavable. Detective Fields also has a dog that will play an important rol in the quest. My first language is not english, so if my accent annoys you, just delete the sounds folder of "Kidnapped". I just voiced the character because is more envolving when you hear them talk instead of just reading. If any other modder, whos first language is English, likes the mod and consider it deserves to be revoiced, feel free to do it. But remember to credit me as the creator of the mod. Just extract the kidnapped.rar in the data folder of you your Fallout 3 installation and check the .esp in the FOMM or in the data files of your Fallout 3 Launcher. The office of Detective Fields is now located in the Canterbury Garage of Canterbury Commons. 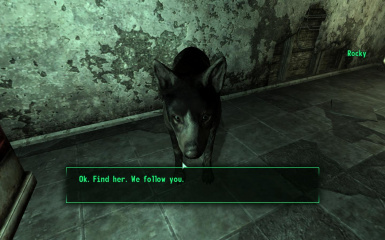 Detective Fields and his dog will be your companions during great part of the quest. But (VERY IMPORTANT ) if the dog crosses a door before you, wait at least one second to cross the door, cause if you cross it simultaneously, the dog disappears. I dont know why this happen. Just follow my previous instructions. If you find another bug or error, please notify me. I dont have mods that make great changes to the game, so I dont know if there are important incompatibilities with other mods, unless those mods use the same locations I used. So far I recommend to uninstall my other mod "Hunting Down the Pint Sized Slasher" because the Detective fields character would be repeated and may cause a bug. But that is just for people who has my other mod installed. and to ChromicLights for lending her voice to the female characters of my mod. Enjoy and endorse if you like.